A decade after making their first film together, Katharine Hepburn and Spencer Tracy re-team for their seventh film. 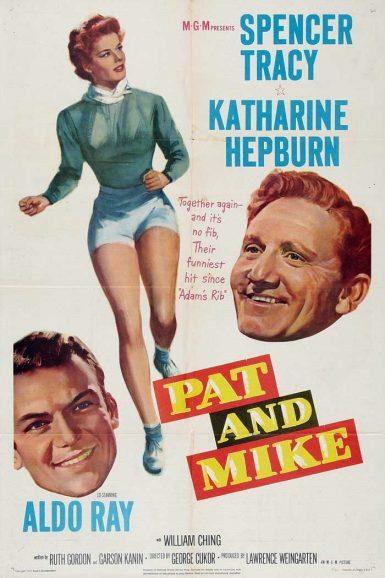 Pat and Mike finds Hepburn playing Pat Pemberton, an all-around world-class athlete… that is, as long as her fiancé, Collier (William Ching), is around. Whenever he is around, Pat falls apart at her matches and events. Probably because Collier feels it is best for her to give up her career and marry him. In steps Mike Conovan (Tracy) and, no surprise, there is an attraction between Pat and Mike. Look for numerous cameos from athletes of that era, including Olympic gold medalist Babe Didrikson Zaharias, as well as appearances by New Beverly favorites Aldo Ray and Charles Bronson.